How do I disable the built-in defragmenter in Vista and Windows 7? Windows Vista and Windows 7 both have a built-in defragmenter which is scheduled to run automatically. You can run both My Defragmenter and the built-in Windows defragmenter if you wish or only one or the other. To turn off the built-in Windows defragmenter, go to the Start menu and type "defrag" into the search box, and open Disk Defragmenter. 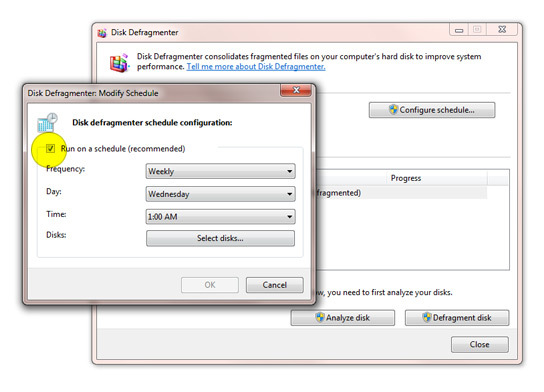 Inside Disk Dragmenter, click on "Configure Schedule" and uncheck "Run on a Schedule."